By now we should have acquired a fairly clear idea of what the Most Holy Sacrifice of the Mass principally IS. It is no less important for us first be clear about what the Mass is NOT, for a good deal of what the Mass is will become much more clear if we understand what the Mass is not. Most Catholics, as Pope John Paul II noted, have either lost, or no longer have remembrance of, the most central aspects of the Mass — and the fault, largely, is not their own. It is the result of a systemic failure in Catechesis over the past 40 years. Bishops — whose principal duty, above all other duties, as “teachers of the faith” – appear to have forgotten, or have simply relinquished, this absolutely vital responsibility, relegating it to others as something of a “less pressing” issue, failing to see that the “larger” issues at hand are an immediate and direct result of this failure. Having been pawned off to — and eagerly seized by — increasingly doctrinaire and “progressive” committees who articulated Catholic teaching not in terms of the genuine Deposit of Faith, but in terms of social and political issues — largely liberal and distinctly feminist — current or correct at the time, the concept itself of “doctrine and dogma" came into disrepute, such that the words themselves became terms of reproach and disdain. In fact, “doctrine and dogma” became the antithesis to endless “enlightened experiment”, which, disdaining doctrinal certainties as somehow regressive, eventually came to repudiate them – however catastrophic the results and however detrimental to the Faith ... and to the faithful. Indeed, we ourselves are not without blame. Unwilling to accept, or even to recognize our own complicity in the matter through our failure to be “the primary teachers of our children” — as the Church insists — the reproach that we legitimately lay on the doorsteps of our “Religious Educators” and Catechists is no less an indictment of our own irresponsibility. It is profoundly true, unfortunately, that the Catechists to whom we entrust our children had themselves acquired little in the way of authentic Catholic doctrine from their own predecessors who themselves were largely ignorant of the authentic teachings of the Church and the Deposit of the Faith ... or disagreeing with much of it, deliberately failed to teach what did not conform to their own partisan commitment to prevailing social, sexual, and gender-related issues. It is equally true that we, as parents, indeed, as Catholics, have been resolutely indifferent to learning many of the most basic tenets of our own Faith. Our own indifference, together with the ignorance or the dissent (or both) of the Catechists and the “professional” Religious Educators — nevertheless remain a direct consequence of the inexcusable negligence of the bishops ... to whom Christ entrusted us as children to a father. The problem is that the father is remote, indifferent, and largely absentee. He has washed his hands of what his children are learning, and appears indifferent to what they are being taught. In this sense, the bishop appears to have taken his cue from the majority of secular fathers with children in public education. Uninvolved and ill-informed, he knows little or nothing of what they are being taught, however destructive it may be to the fabric of the family. By the time the child comes home in confusion because he has been prompted to question his own sexual identity the damage has already been done ... and very often cannot be undone. “If only I had been more proactive, more informed, more involved in my sons' or daughter's education, this terrible situation would never have occurred.” But he laments too late, and he knows it. Something very similar occurred within the seminaries of the Archdiocese of Boston — and at what cost in every way! The negligence and indifference of the bishops exacted a terrible and lasting tribute. Just as it has within the classrooms of virtually every Catechism class (now known as “Religious Education” classes — being neither in any significant way). So what is the point of all this? We know little of our Faith, and therefore even less of the momentous event that occurs each day at our Altars. While this may appear an unkind assessment, it is sadly borne out by the appalling lack of knowledge of even the most elementary aspects of the Catholic Faith by our own children. From First Penance to Confirmation they are “processed”, grade by grade, to “Confirming” that of which they know nothing because they have been taught nothing. This absence of what authentically constitutes Catholic doctrine has created a vacuum in the Mass. We celebrate it and really do not know why. Most often we appear, really, to be celebrating ourselves. In this vacuum, it comes as no surprise that certain things practiced – or left undone – things that have become part and parcel of our experience at Mass – really have no place there. This can be a stinging realization. No one likes being told that they behave badly or without understanding — that what they have long practiced and what has been long condoned and even encouraged, is wrong. In this respect we all lack humility. We do not like being “wrong”. Nevertheless, it remains the case that some things are true and others are not — however this vies with or offends our largely democratically evolved sensitivities that would hold the true to be what best suits the most or the many, or, perhaps better yet, what is least offensive to them. This notion pleases us. No one is wrong. In fact, nothing is wrong. And if nothing is wrong, nothing, eo ipso, is intrinsically right. We have the best of all possible worlds. Truth, absurdity, contradiction — all are concomitant, but ultimately lesser issues. We wish to get along. And we do so by “going along”. In fact, the most certain formula for contention, for not “getting along”, is to insist that 2+2=4 and not another number of our choosing. Our insistence that the sum of this simple equation is 4, and cannot be 5, is surprisingly fraught with deep implications, for it means that the world is not arbitrary — at least the world of numbers, and with the world of numbers, the world of matter as susceptible to quantification of any meaningful sort. If we pay for two apples and receive one, we are not indifferent to it. But there is an inherent tyranny in equations of this sort, and, in fact, in any physical phenomena construed in terms of “laws”, in other words, as sequences or configurations that do, because they cannot, admit of exceptions. We are both constrained and confined by them. People do not like mathematics, not because it is abstruse, but because it admits of definitive and unequivocal answers. There are correct and there are incorrect answers. There are right answers and there are wrong answers — and this infuriates us. There is no latitude. We cannot fake the right answer. And that burns us. It provokes us because it violates our freedom. It constrains our will. Do you doubt it? If we are honest, however, we will admit that often our challenge has little to do with a genuine questioning at all, but is an expression of a contention with our will which we perceive threatened by being deprived of its freedom to choose otherwise. Dostoyevsky, in his famous Notes from Underground, stated it more succinctly: “To me, 2 plus 2 making four is sheer insolence”. Absurdity may perplex us, but it does not offend us. Truth offends us. It vies with our will and is not amenable to it ... especially when it does not accord with our will. So what does that have to do with the Moon as green cheese and the Mass as the Sacrifice on Calvary? It is a prologue to some things that are, and some things that are not — despite our wishing them to be otherwise. Your gift to God in an act of personal munificence and sacrifice on your part for which God should be grateful. A liturgical and linguistic laboratory for avoiding masculine nouns and pronouns, especially as they pertain to God. (if you read your Missal, note substitutions for “His” or "He”, with the personally “corrected” gender-neutral “God”, the addition of “Co-heiresses” to the textually specific “co-heirs”, etc.) No priest has the authority to alter readings, nouns, or pronouns, especially as they apply to God The Father and God the Son! No one has that authority, nor the right to abuse it. A Feminist platform for priests eager to accommodate the secular Feminist agenda that is damaging to the Church and antithetical to authentic Church Teaching. Jesus Christ, hanging on the Cross; He is being crucified right in front of you. His hair is matted with blood from the Crown of Thorns and His face is bruised from the blows of the Roman soldiers and covered with spit from all who mock Him. He is disrobed and open to shame. Even as the blood continues to issue from too many lacerations to count from the Scourging at the Pillar an hour before, and the nails hold fast against the flesh yielding under the weight of the cruciform figure of Christ, He is crying out in agony to His Father. Mary, His Mother, is standing before Him crying inconsolably, and would crumple to the ground were she not borne up by John and Mary Magdalene. They are weeping uncontrollably, too. All around, pious women are weeping and wailing, men are sobbing and jeering. It is a scene of utter desolation, unfathomable sorrow, a torrent of tears and a torrent of taunts. Have you grasped the scene? 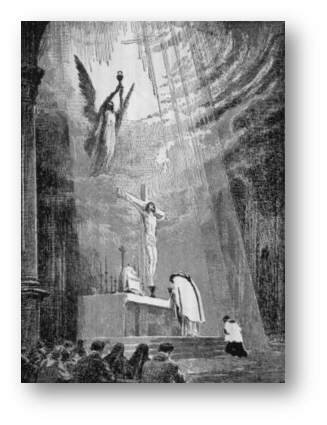 THIS is what is being enacted before you at the Most Holy Sacrifice of the Mass. The electric guitars are plugged in, the drum and trap set are being set up, and the piano is being tuned. The acoustic guitars are being strummed aimlessly, and the flute trills sporadically in the background. There is chattering intermingled with laughter among the musicians. They are preparing to entertain the sobbing women, the raging men, and the indifferent spectators looking on. The entertainment is about to begin and Cat Stevens’ (now a Muslim), “Morning has Broken” is the song that will first greet us on Calvary after the MC of the musicians cordially welcomes us to the Crucifixion. Throughout the Mass they will compete with Jesus Christ on the Cross for our attention and adulation, calling us away from the Cross — that we made of our sins for the Son of God to hang upon — to their virtuosity as singers, guitarists, or piano players. They will entertain us. But we are a restless audience, and demand more than music during this drama. We want comedy, too. The priest accommodates us, demonstrating his own virtuosity as an entertainer. He had stood briefly at the Altar by the Cross, but is now eager to leave the summit of Golgotha altogether and to walk among his audience. He leaves the Sanctuary of suffering and walks the aisles and avenues of the spectators, much in the manner of talk show hosts trying to garner the attention of the people for himself. What better way than comedy? And he is well provisioned with anecdotes and jokes ... some rather "sly" and just slightly “off-color” (“what a rascal!” we smile, as insiders of the joke with him). There may be a “question and answer” session in the style of successful television hosts, but the point is to make you feel terribly good about yourself, and him — despite what is going on in the background, on that sad summit that he quickly left and where Christ still hangs. With the “punch-line” the skit ends, sometimes vaguely connected with what is going on with Christ, or something He said prior to His being raised on the Cross. Still restless, the audience is once again entertained by the musicians, and they remain once the Crucifixion has been consummated and Christ is dead on the Cross ... awaiting our applause — which we extend them despite a sense of terrible incongruity with all that has happened in the background and from which we had been constantly pulled away ... lest we see or understand the consequences of our sins ... and the magnitude of Christ's love for us. An impolite assessment, to be sure. But a very accurate assessment ... nevertheless. There are, of course, many other things that the Mass is not. These are merely the more salient among them, for they are, very likely, what we encounter most often before, during, and after Mass, in the trivializing of the most momentous act in history that unfolds before us. We can, however, clearly grasp what it is not ... even if we would have it otherwise. What we have learned today: The Most Holy Sacrifice of the Mass is the occasion of the utmost reverence. It is Holy Ground, and we stand, really and truly, before Christ crucified. Christ has died on the Cross ... and we have died with Him. And because we have died with Him, we will also rise with Him ... not in applause ... but in the Resurrection.